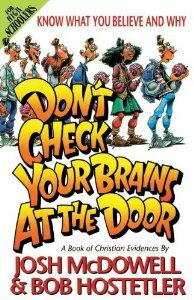 When I was a teenager, I had a Josh McDowell book called Don’t Check Your Brains at the Door. While I can’t specifically remember anything from the book, basically the gist of it was that you don’t have to throw logic out the window to have faith and that young people should understand and own their faith, not just numbly follow their parents’ faith. Sometimes I think that Christians believe they have to check their brains at the door. For example, I see a trend of Christians not believing in science because everything has to be the miraculous work of God. It’s like if I credit science or medicine for someone’s healing, I’m not being a good Christian because I’m not saying it’s a miracle or answered prayer. However, what if scientific advances themselves ARE MIRACULOUS? What if the God-given creative power of humans to develop new technology IS PART OF GOD’S WORK? What if I thank both science and God for that healing? I don’t think there’s anything wrong with that. Ever since I read A Wrinkle in Time by Madeleine L’Engle in sixth grade, I have believed that science and faith can work together and don’t have to be at odds. (If you haven’t read L’Engle’s Time Series, you are missing out on some great literary, scientific, and spiritual works. Also, note that L’Engle was a Christian.) Lately I’ve been listening to a podcast called Ask Science Mike that has reaffirmed my position. As it turns out, there’s a scientific reason for almost everything. There are even scientific studies on prayer and religiosity. This does not have to threaten our faith, though. When I was in college, I took a class called Intro to Biblical Faith. My professor, Dr. Tim Green (an Old Testament scholar), really opened my eyes to a new understanding of the Old Testament. He shared with us that there were actually scientific explanations for the burning bush and the parting of the Red Sea. I can’t remember the Red Sea explanation, but I remember him talking about some kind of desert brush plant that would sometimes spontaneously combust but not turn to ash. But Dr. Green also told us that having a scientific explanation for these miraculous stories did not negate the spiritual meaning of the stories. These stories were an important part of the faith history of the Israelites. From these stories we can learn that God cares for his people and wants to save them. That God can speak to us through nature and imprint desires and calls on our hearts. Just because the burning bush wasn’t a miracle doesn’t mean the story of God and Moses is meaningless. Going back further, I remember in high school I once gave a speech on creation and evolution. I argued that God created the world and that evolution did not happen. I did this despite the fact that when I learned about evolution in Biology class, I thought it made sense. Survival of the fittest made sense. Adaptations developing based on habitat, environment, and food sources made sense. However, I didn’t think I was allowed to believe in evolution. I was supposed to stand up for Jesus and for my Beliefs. It’s just another example of how sometimes Christians think they have to throw away logic in order to have faith. Today, I believe in evolution. I also believe God created the world. And I don’t think those things have to be at odds. Evolution makes sense. For a long time I said that I believed in evolution except that I didn’t believe that humans came from apes because the Bible says God made humans separate and unique from animals. But here’s the thing: No other species on earth possesses the intelligence, creativity, abilities, and language skills that humans possess. Even the most intelligent animal species don’t compare to humans. Animals don’t build civilizations, create airplanes, write books, search the Internet, or become multilingual. It is clear that humans are indeed unique compared to other species. How that uniqueness developed doesn’t really matter to me. The other thing I remember is that evolution is a theory. Scientifically that means there is a lot of evidence for it, but it cannot be completely proven. The truth is that no one really knows how the world was formed and created because no people were around back then. As Christians, we don’t have to throw away logic, reason, and science to be people of faith. Perhaps believing in both faith and science feels like a place of tension to some. That’s okay. Living in the tension is okay. There is room for people of faith to also believe in science. No matter where you fall on the topics of science and faith, though, just remember: Don’t check your brain at the door. On My Faith Crisis: Why Now? I appreciate your point of view and your honesty! Thank you. That sounds like a great book. One of the things I appreciate about the current Catholic church is that it does take science seriously and does not teach that it competes with faith. I think that the recent papal encyclical shows the use of environemntal science in conjunction with our responsibility to earth and the human community. It is also addressed to all people of good will rather than being confined to one religion only. We really need everyone’s brains engaged at all times to deal with global problems. Faith and Science absolutely go together. The Bible is a book of “moral” science. It explains the cause of man’s sin problems, and gives a scientific solution: the science of salvation. There are certain steps to take in dealing with sin, and if done correctly, and with faith, the results can be verified. Hatred can be removed and Love will be put in it’s place; selfishness taken away and selflessness put up; lust removed, and pure desire established. But this is not the kind of science that carnal man wants. What he wants is to deal with the sin problem in his own way. This usually involves retaining the sin, but finding ways of dealing with the consequences. So instead of real peace among the nations (or maybe just all merging into one big peaceful nation? ), we have the science of diplomacy, and the bargaining table. Instead of victory over our appetites, we have the science of triple bypass surgeries, and insulin injections. Instead of the angel of mercy we have the entrepreneur. Science is only the study of the laws of nature. God never put a wall around that knowledge…it’s free for us to study. But is all that accumulation of knowledge being “used lawfully”? This is the important question. Are we in any way better people morally than our great grandparents, because we have iPhones and YouTube? If not, then it’s all just fig leaves, and will leave us desolate in the end. Notice the words “reasoned”, “probably”, “seem to have had”, “difficult to tell”. In short, they have proved the origin of birds based on a bunch of assumptions which were in line with what they wanted to believe anyway. I wouldn’t give a farthing for this kind of science. And where does it leave us? Without a God who cares, without a Father above who loves us, and without the image of God to look up to, and to emulate, and to strive for. Yet that’s the very thing man needs, is to understand God as revealed in Christ, and to become like Him. Frank, I think that science gives us empirical, quantifiable evidence while faith doesn’t give us much evidence. That’s why it’s called faith – believing in what we can’t see or prove. But while I may disagree with some of what you said, I liked how you said that we are left with a God who cares and loves us! We can agree on that, and I’m glad to have a point on which we can come together. I’d like to hear about your disagreements! I didn’t come here to argue, but to learn. You wouldn’t offend me by explaining why or how you differ. But on the subject of faith. “Faith is the evidence of things not seen”. This should not be confused with childish fairy tales, ie. “if I wish upon a star”, or “if I really desire something strongly enough, it will come to me.” Faith is not wishful thinking. Nor is it presumption (doing crazy things in the hope that God will add His power to my craziness). Luther defined faith as “a divine work in us which changes us and makes us new men” (or women). Therefore, faith is not our attempt to “try and believe”, but something that God puts in us, with our permission, that allows us to open the door of our mind to His power and grace. This is done in the spiritual realm, which is not measurable by natural scientific tools. But the results can be seen in the natural realm, as Jesus said to Nicodemus (“you can’t see the wind, but you can see the effects of it”). The Bible is full of examples of the power of this divine faith. And there are plenty of illustrations in the last 2000 years of history too. As for myself? I was raised on science, but science is powerless in the spiritual realm, in the moral area of life. There, only faith prevails. The small amount I’ve seen of the power of real faith, impresses me greatly, much more than man landing on the moon. 1. Why are we here (what is the purpose of man)? 3. Why do we die? Frank, I think I can agree with everything you wrote here. Science may explain how we have life, but spirituality explains why we have life. Where I disagree with above is I don’t see the book as a book of moral science. I tend to reject formula-like expressions of Christianity, and your explanation felt a little formulaic. If sin can be completely taken care of and gotten rid of, as you suggest, then why do good Christian people do bad things sometimes? I tend to think that we are all a mix of light and dark, good and evil. Perhaps that’s more of a Buddhist thought than a Christian thought. I don’t know that all the darkness in our hearts can be completely removed, but I do think that Christ’s life and the Christian faith urge us to live in the light and choose love and goodness. And Christianity teaches grace even when we mess up and choose evil. I think the Bible is the story of God’s people written by God’s people and inspired by their relationship with him. Sorry, I meant to say I don’t see the Bible as a book of moral science.